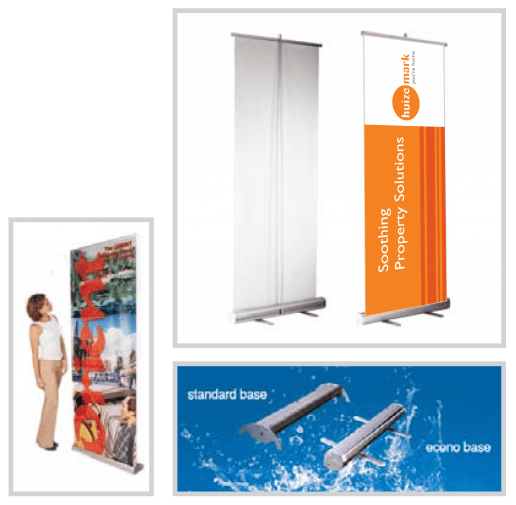 Manufactured from materials such as aluminium, graphite, polyester, polypropylene, PVC, Velcro, cotton, etc, these display items are lightweight and easy to assemble. 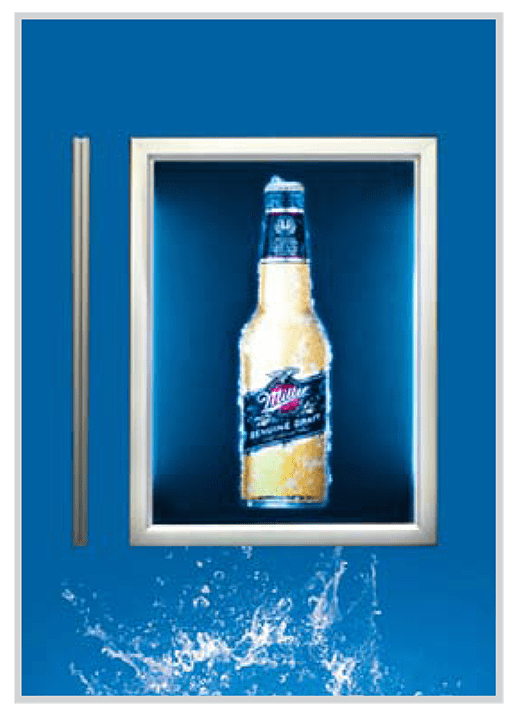 They serve to create awesome brand awareness advertising, indoors or outdoors. 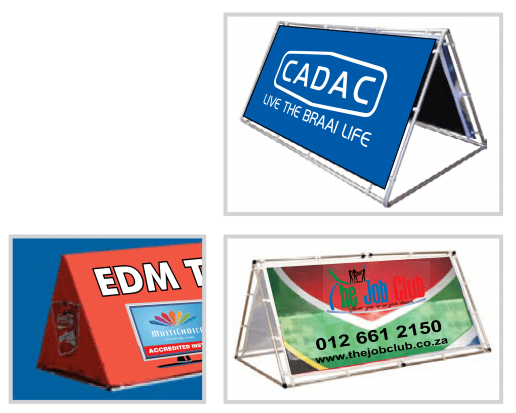 They bring attention to (and give exposure to) your target market, and can be used as backdrops or promotional instruments. 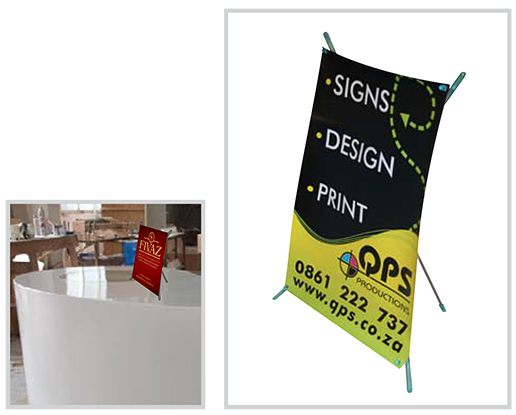 QPS Productions can assist you in increasing the sales of your products with expertly designed and manufactured merchandising stands. 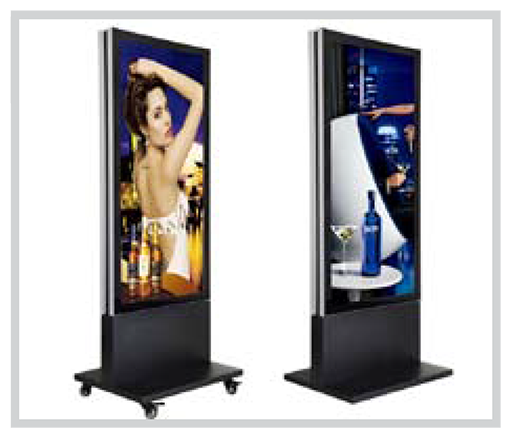 These lightweight systems project brand awareness, image and encourage customers to purchase your product. 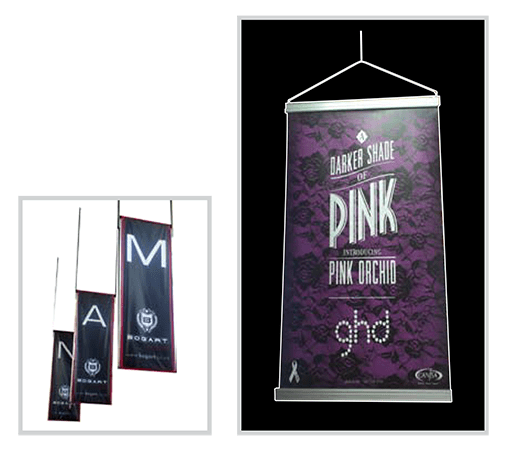 Promotional Banners are printed with UV resistant inks on the strongest reinforced material on the market, making for a weather resistant branding tool. by a single person.A favourite for showrooms and any indoor displays. Digitally or screen printed onto a quality non-curl PVC & can be single or double sided. Retracts easily into base for portability and storage. Can be set up in under a minute by one person. Just like the traditional sun visor system with sprung wire circle sewn into a pocket. 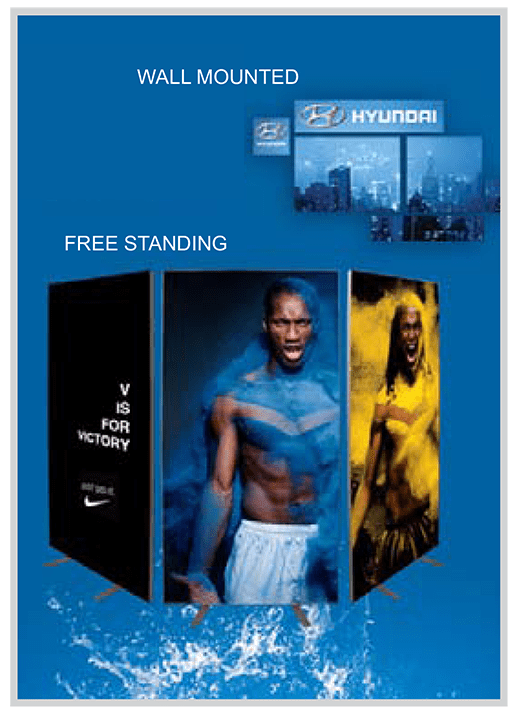 The Pop-Up Display is easy to use, lightweight and requires little effort to assemble. is ideal for both indoor & outdoor displays, & is easy to assemble. events or showrooms, both indoor & outdoor use. 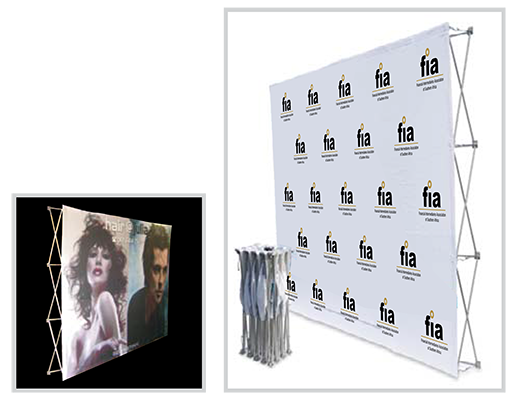 The most versatile back-wall exhibition stand in the market, banner walls are digitally printed onto bannerweave (as a single panel) Stands are lightweight and can be easily assembled by one person. Finished product is supplied as a single unit in a carry bag. Digitally printed onto fabric or PVC, these banners are ideal for permanent or temporary promotional branding. 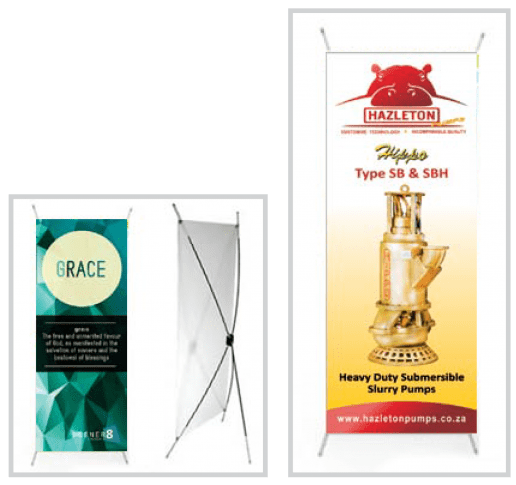 Suspended between two aluminium rods or with a specially built permanent frame, these banners allow for interchangeable branding. Can be single or double sided. Chromadek is an epoxy coated, galvanised steel sheet used for exterior & interior signage applications. It is the most commonly used signage material. 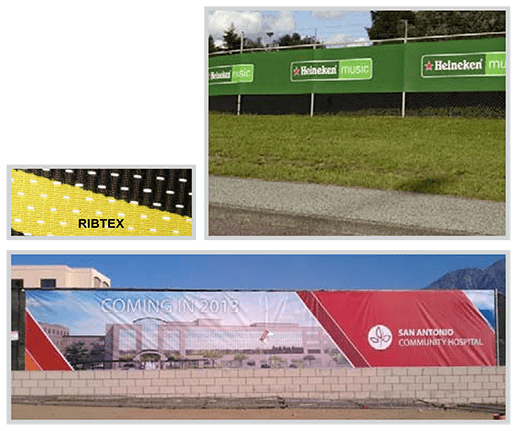 Fencewrap is digitally printed onto Ribtex, which is a special fabric with reinforced holes to allow airflow. Can also be printed onto PVC material. Ideal for any outdoor events or fence advertising. Supplied in panels in whatever lengths required. Display banners are digitally printed onto Ultrasheen, and can be single or double sided. The rods are either fibreglass or aluminium & standard outdoor spikes are bearing operated and electroplated. 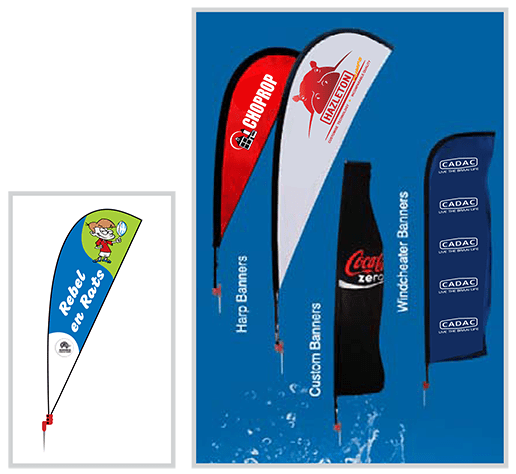 This is an excellent product for outdoor use, both as promotional & permanent branding options. 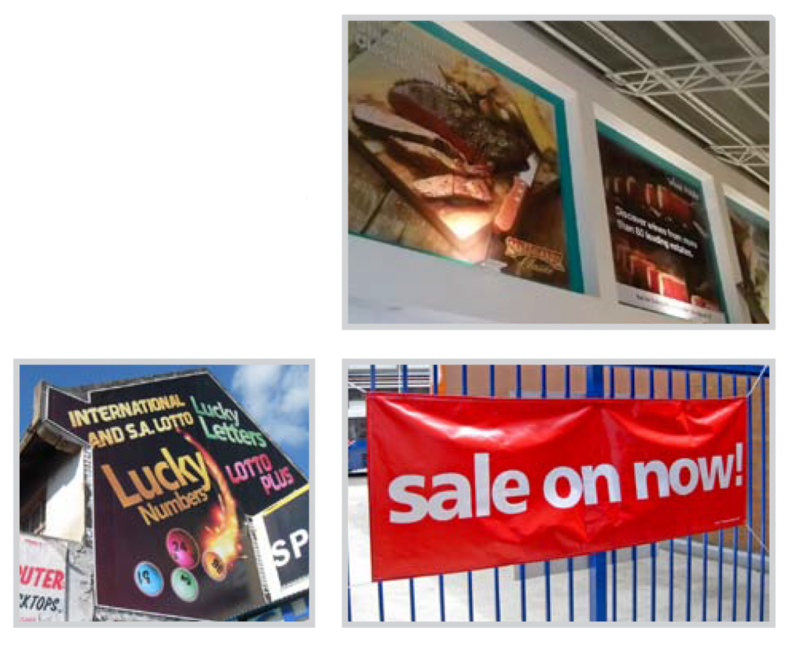 Telescopic banners are digitally printed onto Ultrasheen, and can be single or double sided. The rods are either fibreglass or aluminium & standard outdoor spikes are bearing operated and electroplated. 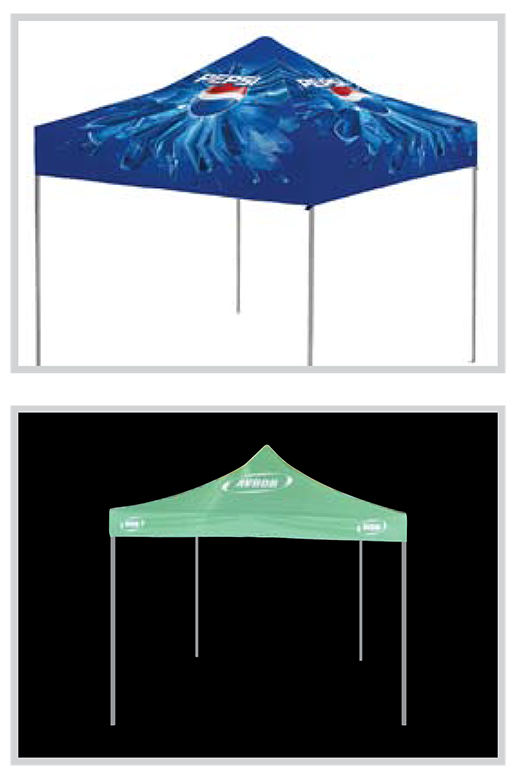 This is an excellent product for outdoor use, both as promotional & permanent branding options. 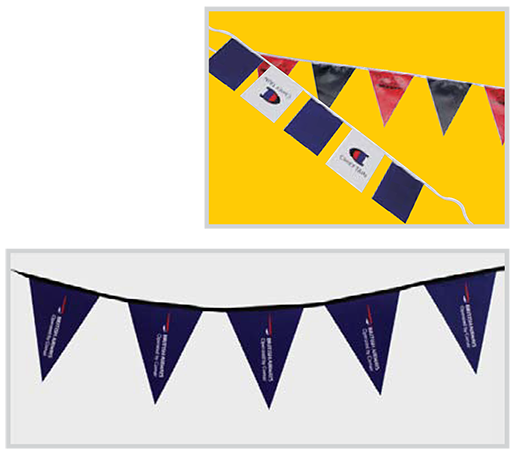 Our banner flags are digitally printed onto PVC – single or double sided Banner poles may be powder coated to any colour to match your corporate colours. 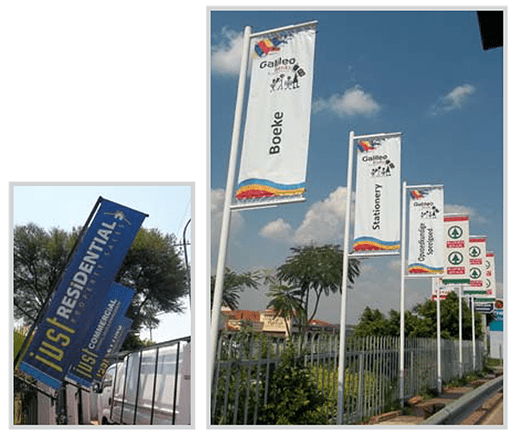 Banners can be roof/fence or ground mounted. 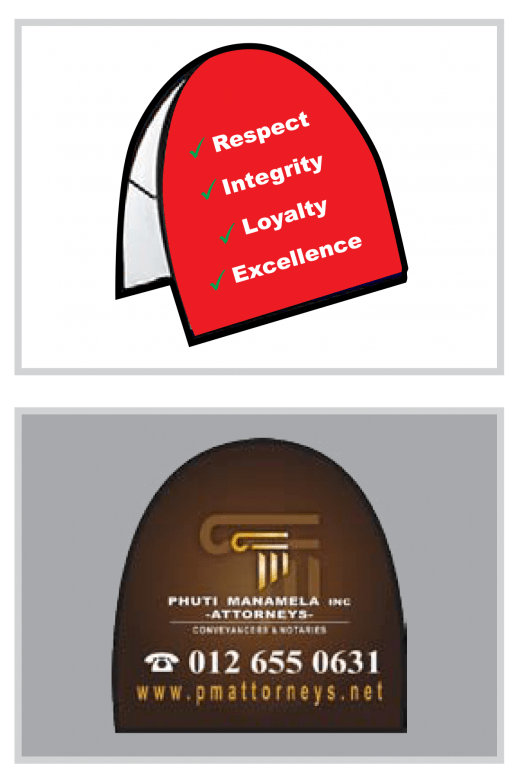 Really put your company on the map with a specially designed corporate flag. Digitally or screen printed onto Bannerweave material. 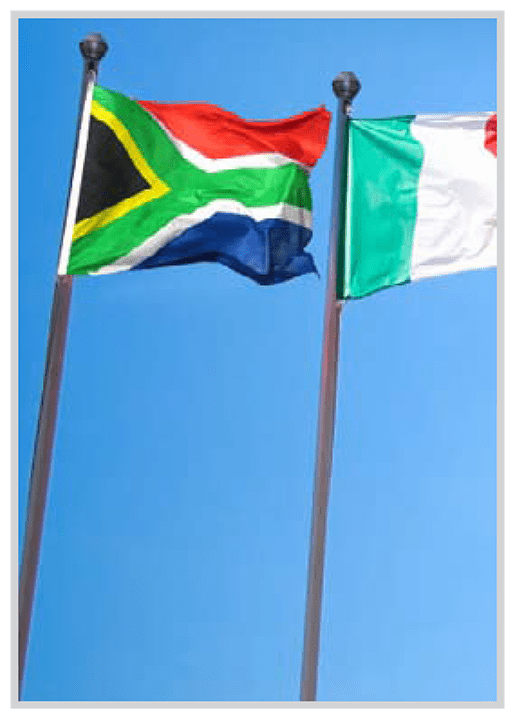 Cluster flags are available in sets of 4 or 5 and are digitally printed. 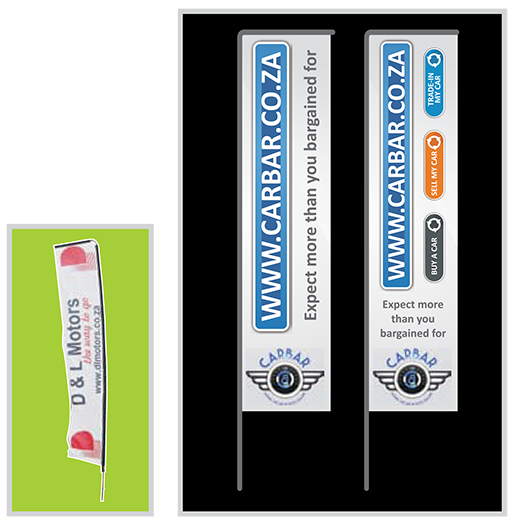 Cluster flags are ideal for indoor & outdoor promotional displays. All hardware is aluminium and folds neatly into a small bag. 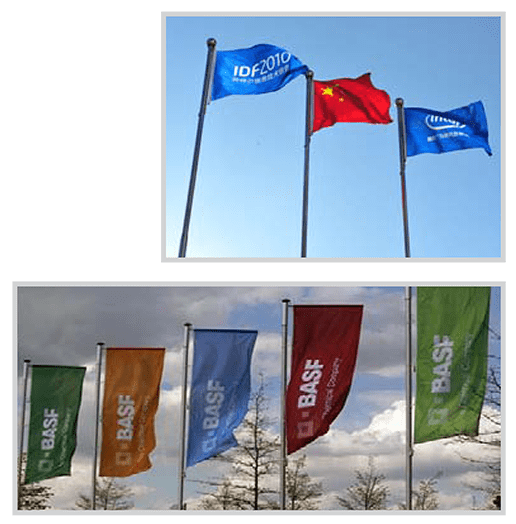 PVC flags on a nylon rope are available in a variety of colours and combinations. They can be used to draw attention to your store, sales office, car sales garage, exhibitions etc. Especially used by estate agents on house shows to grab bypassers’ attention. This product works well in conjunction with other branded materials. 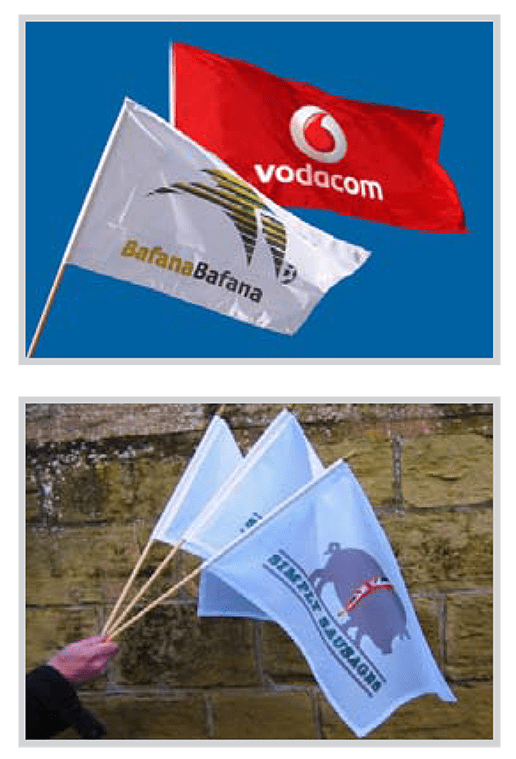 For a fun promo item on sports days or for school/college functions, why not try our waving flags. 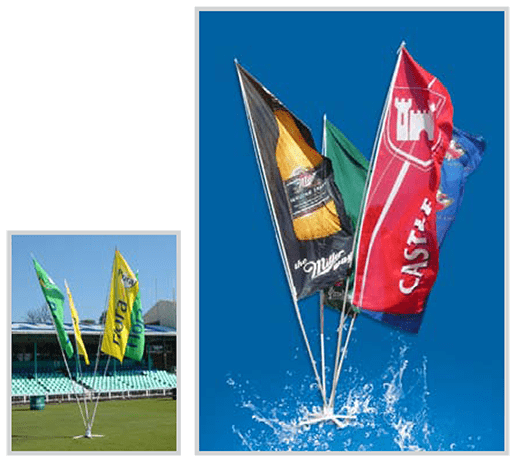 Digitally printed onto Ultrasheen/Pongee & supplied with plastic or wooden sticks, these flags are light on weight & heavy on fun. Size: Various sizes – made to clients specifications. Country flags are screen printed onto bunting. 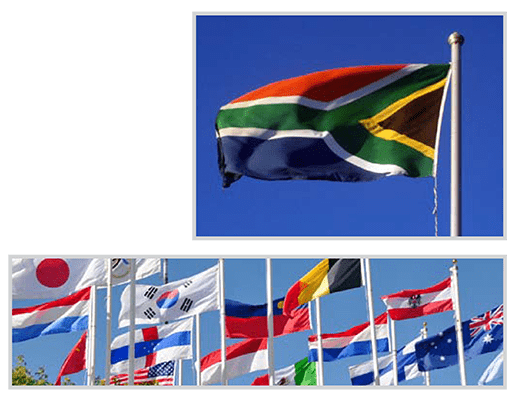 All the country flags of the world available in various sizes. Easy to transport and assemble, includes a carry bag & expand-framework. Banners can be digitally printed or screen-printed onto water resistant canvas on the side flaps or roof sections. 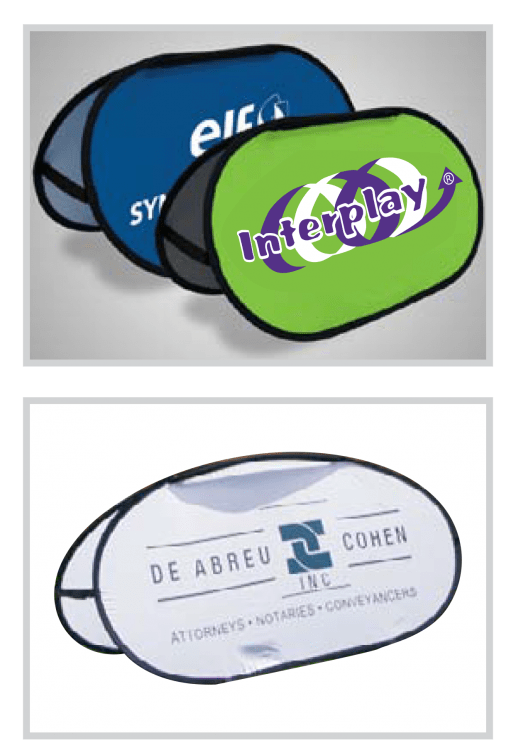 This product is a great outdoor event branding item. Digitally or screen printed onto water resistant canvas with the option of a rubber or concrete base. 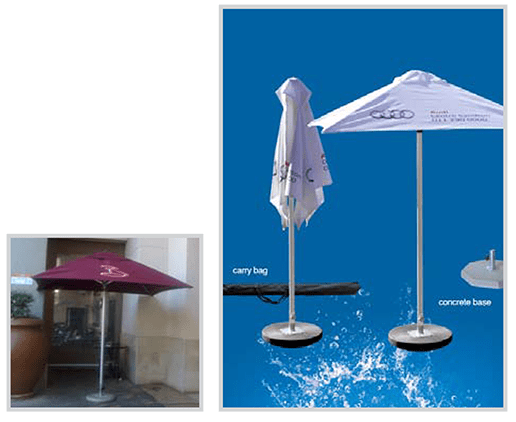 Umbrellas are quick and easy to set up and supplied as a single unit in a carry bag. 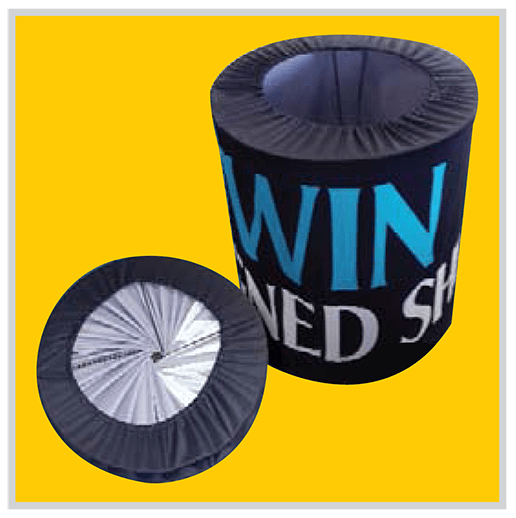 The new and innovative Event Bin is printed on Bannerweave, easy to setup & collapsible. The print can be replaced for different events. Ideal for indoor and outdoor events. Has a lightweight fibreglass frame, elastic and carry bag included. 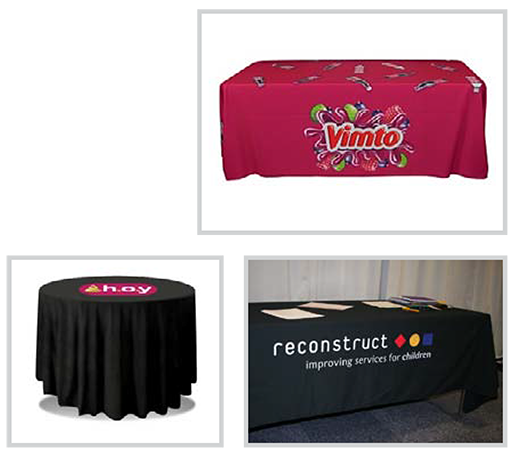 Digitally printed on banner weave or canvas, table cloths are hemmed all round to fit most table sizes. Made to fit any table shape round or square. Custom designed for maximum impact, give your stand the professional edge. 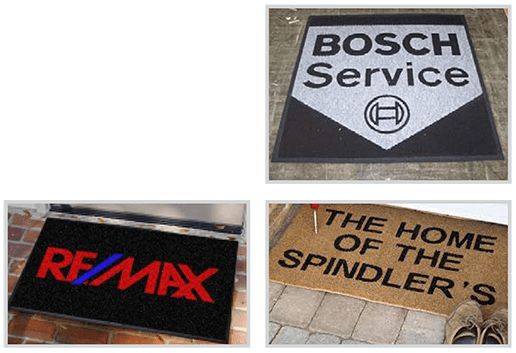 Personalised doormats are the perfect way to welcome prospective clients into your shop. On our doormats the logo is cut out and inlaid by hand– the logo will never fade or walk off. Reinforced non-slip rubber backing is used, making your mat safe so that it will not slip or move, and a bevel edging ensures the mat remains flat. 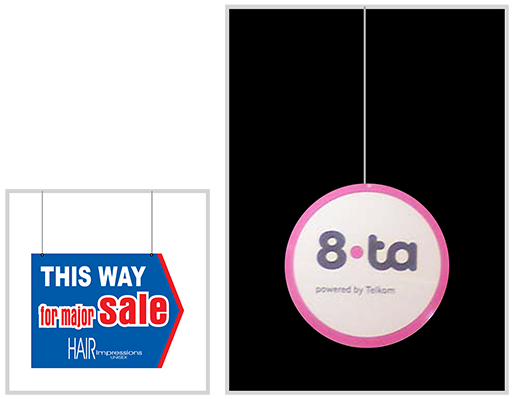 Mobiles are lightweight hanging shaped correx signs, ideal for any sale or promo event. These signs are low cost for high impact. Can be custom designed to fit any need, & can be single or double sided. Our fabric frames are made up of a fabric print stretched over an aluminium frame. Frames are freestanding or wall mounted and can be tiled to make a giant display unit. Available in double or single sided. 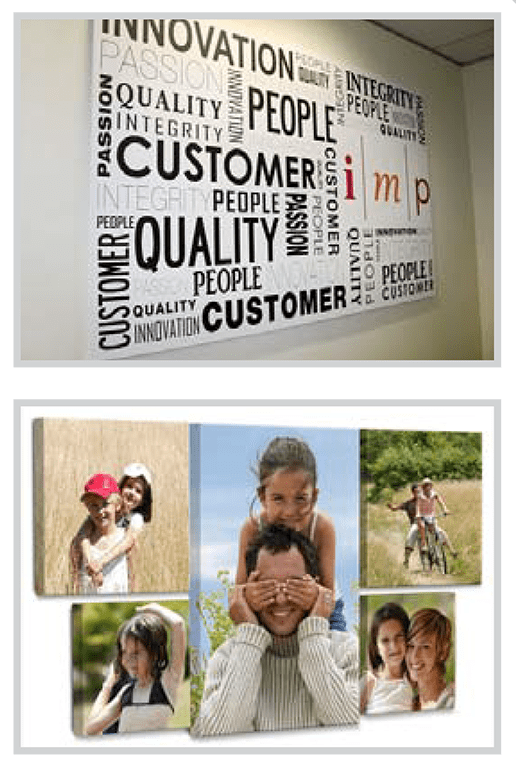 Our canvases are digitally printed onto a quality canvas material. It can be mounted and stretched over a mounted wooden frame for a professional polished look. Ideal for corporate or personal interior spaces. 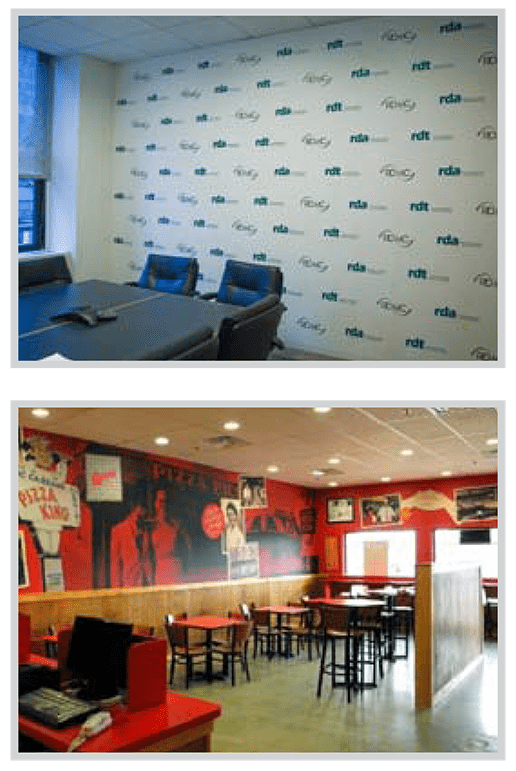 Whether you are looking for corporate wallpaper that embodies your brand or personality, wallpaper for childrens rooms or personal living space, or any custom interior wallpaper theme – we can make it happen! Clip frames are made of quality aluminium, and are lightweight and portable. Can be suspended, wall mounted or uses with floor mounted accessories. Enhance your graphics by creating multiple framed configurations. Frames are 25mm-32mm thick and have a protective polypropylene non-reflective clear PVC face. Perfect for internal or external use. Sleek aluminium snapper frame system allows for interchangeable prints. Supplied with cable. Lightbox prints are supplied on paper or vinyl & prints are back-lit using LED lighting. 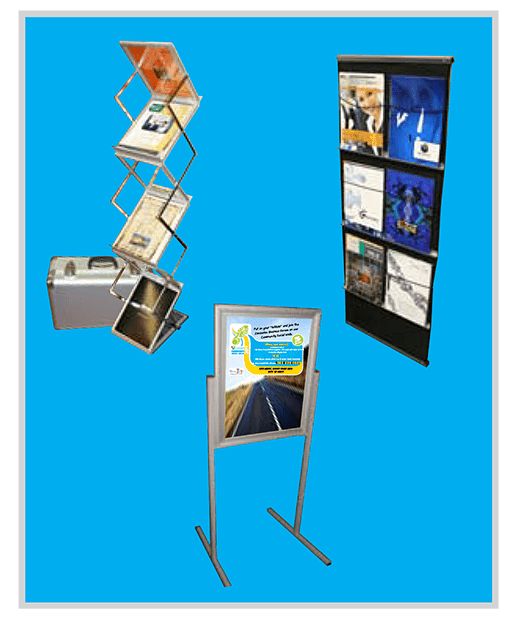 We have various options for brochure display systems available. 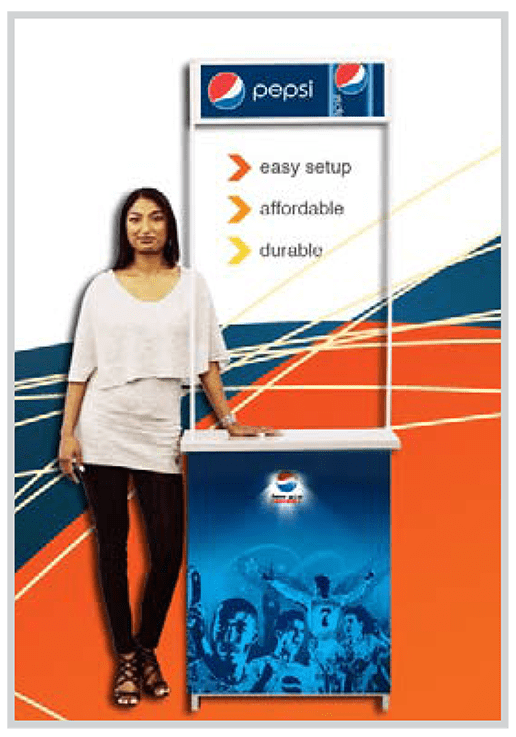 The brochure stand is made of aluminium and/or canvas for lightweight portability. The display units are easily assembled (no tools required). Let us know what you need and we will find the right option for you. 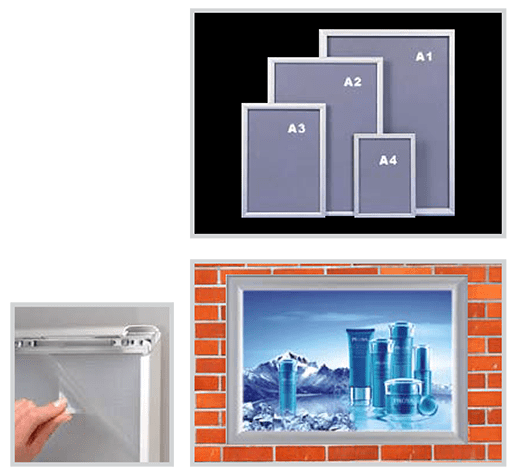 We can manufacture custom display systems to suit your every need, using a wide variety of materials, like Aluminium, Perspex, Di-bond, Forrex or ABS. We can design you a proposal to suit your company image, incorporating your brand & colours. 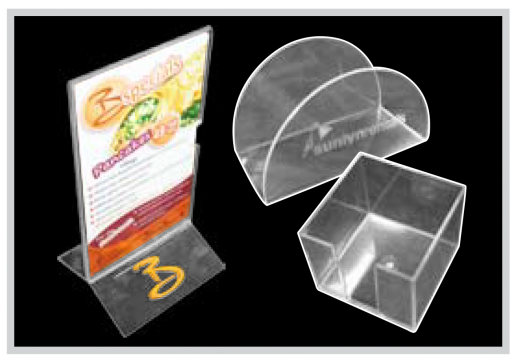 Clear perspex brochure, flyer & business card holders, can be for table top or wall mounting. Available for every size brochure or flyer. Can be branded with a silkscreen print, sticker, sandblast or engraving. Custom designs can also be made to fit your every need.